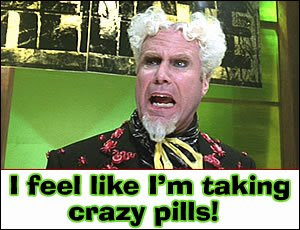 Alexa Shrugged: I FEEL I'M TAKING CRAZY PILLS!!! WHAT IS GOING ON IN THIS COUNTRY?!?! The least accomplished, most inexperienced empty-suit of a radical liberal could win the presidency - with even North Carolina leaning blue! I am about to be represented completely by Democrats - in VIRGINIA! Al Bleeping Franken could become a SENATOR! As Mugatu would say: I FEEL LIKE I'M TAKING CRAZY PILLS!!! Or more accurately, I feel like the only person left NOT taking crazy pills! Of course I couldn't pass up barrel of gaffes Joe Biden! JOBS is my favorite 3 letter word! J-O-B-S! And people are comparing Palin to Quayle?!?!?! I FEEL LIKE I'M TAKING CRAZY PILLS!!! 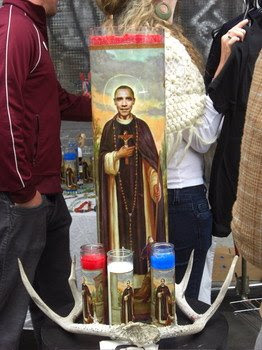 People really think Obama is The One, The Messiah. I FEEL LIKE I'M TAKING CRAZY PILLS!!! I was going to make this a whole long post, but instead I'm going to add new bizarre items every day that make me think to myself: "I FEEL LIKE I'M TAKING CRAZY PILLS!!!" It is crazy. I have been puzzling over how the media has come to use their position, as the public's source of information, to keep the public ignorant of Obama's obvious radicalism. This man is very comfortable with every kind of anti-American radical, and they are comfortable with him. To top it off, anyone who exposes what should be immediate disqualifiers for a presidential candidacy is being labeled a smear tactician. It's as if you informed the day care that they are about to hire a convicted child molester, and they accuse you of slander and hire the guy. I hope it is okay to post this link: The Friends and Associates of Barack Obama. This guy does more than pal around, he is long-term close allies with criminal slumlords, racists, socialists, communist party members, unapologetic domestic terrorists, and you can bet that the worst ones are the ones we DON'T know about.